KDP staffers have put together a list of 10 quotes to inspire you this week. Share your favorite quotes in the comments section below! On October 24th, the United Nations (UN) will observe its 72nd anniversary on the day of the original signing of the UN Charter in 1945. Over its history, the UN has evolved to stand for more than just crisis mediation. For example, in September 2015 the 193 member states of the UN took on the enormous task of adopting Sustainable Development Goals (SDGs), a set of objectives consisting of 17 global objectives and 169 specific targets all designed to create a positive impact on our future by 2030. KDP was recognized by the UN Department of Public Information (DPI) as a Non-Governmental Organization (NGO) in 2010, with the intent of our contributing to UN efforts designed to have a significant impact on advancing quality education on a global scale. KDP currently has five official professional and youth representatives accredited before the UN. These KDP representatives participate in UN events (workshops, conferences, seminars, media campaigns), and support publications and projects designed to keep KDP members and the UN DPI informed of educational activities that may be relevant to the community at large. In those ways KDP can and does play a key role in helping the UN achieve its sustainable development goals in education. Serving as one of those professional representatives for the last year, I have had the privilege of attending and reporting on several important events, to include the Committee on Teaching About the United Nations (CTAUN) conference. I have also posted UN events and activities on KDP’s Global and blogs. A recent highlight of my service as a KDP representative to the UN was my selection to attend the United Nations General Assembly (UNGA) during the week of September 18th. The passion and enthusiasm from most of the world’s leaders attending the UNGA was not only exhilarating but reassuring. This opportunity also gave attendees access to many important UN side-meetings being conducted around the city designed to address the 17 sustainable development goals by many professional organizations. As should be expected, education was a primary agenda topic at the UNGA because it is widely accepted by all UN representatives that education (particularly SDG#4) is the fundamental foundation stone for achieving all the other sustainable development goals. There were discussions about the need for funding and investments, and also on the need to leverage and share resources and opportunities across local, national, international levels. There was also discussion among many of the attendees about other related global challenges, such as early childhood education, educating female children and educating the millions of refugee children suffering in camps today. Discussions concluded with the goal of increased collaboration, sharing and helping one another to make access to quality education more of a reality across all the globe. CTAUN has a special event for high school teachers and students scheduled at the UN from 10:30 a.m. to 12:30 p.m. on November 9, 2017 entitled: “From Desperation to Inspiration: The Anne Frank Diary at the United Nations.” The event marks the 70th anniversary of the publication of Anne Frank: The Diary of a Young Girl. The program will help students learn about Anne Frank’s life during the holocaust and will also enable participants to better understand the work of writers whose lives were impacted by discrimination. CTAUN offers research to bring global issues of Peace & Reconciliation; Refugees; Sustainable Development Goals; Coping with Climate Change and Cultural Diversity & Cross-Cultural Communication into the classroom. For more information, contact: teacherresources@teachun.org. The Guided Tours Unit at the United Nations Visitor Centre also has an exciting Children’s Tour for elementary school children. It opened in February 2013 and is tailored for children 5-10 years of age, with topics such as human rights, disarmament, peacekeeping, and the sustainable development goals, presented in a child-friendly way. Tickets for the tour can be purchased online at: http://visit.un.org/content/tickets. If you ask a teacher why he or she chose a career in education, chances are that the answer will be to make a positive and lasting impact on the lives of students. While those of us in education share in this desire and have witnessed the difference a teacher can make in the lives of their students, a 2016 study by the United Nations revealed just how critical the role of teachers is in making the world a better place. In monitoring the progress toward achieving the UN’s 17 Sustainable Development Goals—goals that aim to realize a world with no hunger, no poverty, gender equity, peace, and more—it was determined that without achieving the goal of quality learning for all and lifelong learning, none of the other 16 goals will ever be realized. World Teachers’ Day is October 5, a day to recognize and celebrate the committed educators around the globe who help youth and adults to acquire the skills and knowledge needed to live a happy and productive life. Celebrated since 1994, it has become an occasion to empower educators, to assess the state of the teaching profession around the globe, and to consider ways to address the remaining challenges, especially the acute shortage of teachers. According to the UNESCO Institute of Statistics, if we are to achieve universal primary and secondary education by 2030, the world needs 69 million new teachers. In today’s world, teachers are more important than ever before. While we add our voice in acknowledgment of teachers on World Teachers’ Day, in the KDP community, we celebrate teachers every single day. KDP strives to continually support its educators through professional development opportunities, networking, online resources, publications, and financial assistance. Just as we understand our students need differentiated instruction, professional development and resources also need to be tailored to differing needs of our educators; so resources, such as our monthly newsletters, vary by professional position. Whether you are a preservice teacher, a teacher preparation faculty member, or practicing professional, we strive to meet you where you are. We are united by a shared commitment to excellence in education and to one another’s professional growth. As the world celebrates teachers on October 5, we know one day of recognition isn’t sufficient given the critical role of teachers in society. So, KDP celebrates teachers each and every day. We applaud you, thank you, and cheer you on because you are indeed making the world a better place. 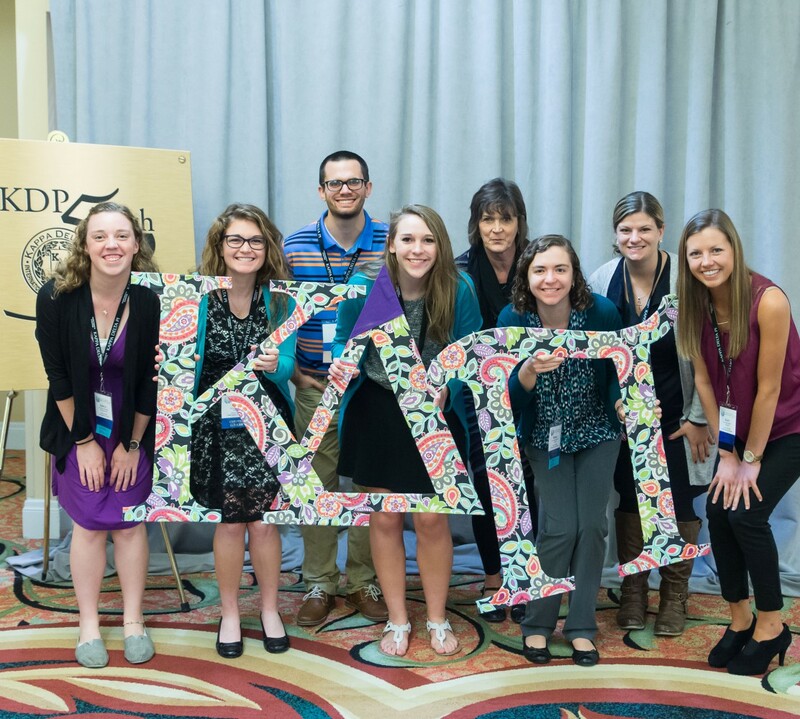 Faye Snodgress is the Executive Director of Kappa Delta Pi.